Our warm, sunny March is leading us right into April shower season! With those rains we can easily have power outages, flooding and fallen trees. There’s nothing fun about a huge tree falling and damaging our own things, but when it falls on our neighbors’ property, it’s even worse. 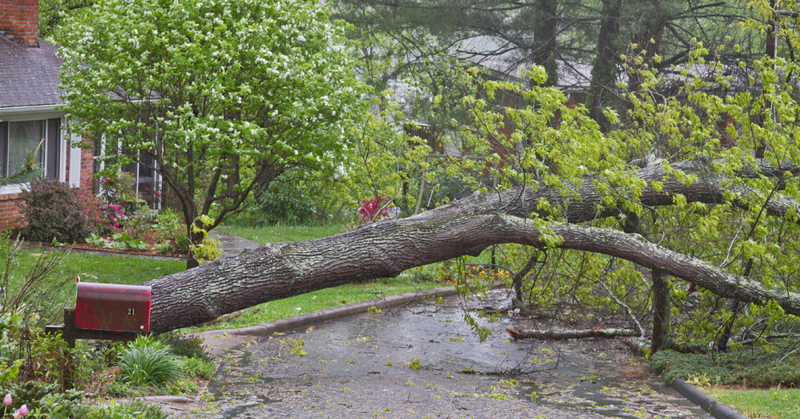 Allen Tate Insurance is often asked the question – when a tree falls, who is responsible? You may be surprised by the answer! If a tree on your neighbor’s property is in “good condition” and it falls onto your home/property during bad weather, it will be your responsibility to file a claim with your insurance company since the damage did not occur due to any negligence on your neighbor’s part. In this instance, you are responsible for your property, just as you would be if lightening were to strike your home. Ask your neighbor to contact their insurance company to see if they are responsible for any of the damage to your property. The best advice is to allow the claims adjusters from both sides to subrogate if necessary. If a tree on your property falls on your home, you are responsible for any repairs to your home and the tree removal. Your insurance policy will pay for damages after you pay the deductible. If a tree on your neighbor’s property is “dead or dying,” and you see it as a possible risk that this tree may fall in the future, you are responsible for notifying your neighbor (notify in writing!) regarding your tree concern and its potential to fall or damage your property. This will protect you if the tree does in fact fall and damage your property. If you have proof that you notified the neighbor of this risk prior to any damage occurring, the neighbor’s insurance company will be responsible for any damage and/or tree removal. And who’s responsible for getting rid of the fallen tree? Limited coverage is provided on the homeowner’s policy to remove a tree that has damaged a covered property due to wind, hail and the weight of ice, sleet or snow. This coverage responds provided the tree 1) damages a covered structure or 2) does not damage a covered structure but a) blocks a drive way and prevents a vehicle from leaving or b) blocks a handicap ramp or fixture. Remember- there is no coverage if the tree is simply unhealthy and falls and does not hit a covered structure. If this happens, the expenses are the responsibility of the homeowner, not the insurance company. Best tree advice – make sure your trees are healthy and remove them if they appear lifeless or leaning! Be sure to check with your trusted Allen Tate Insurance adviser with any questions. Robin Price is the President of Allen Tate Insurance. When it rains and the wind blows!